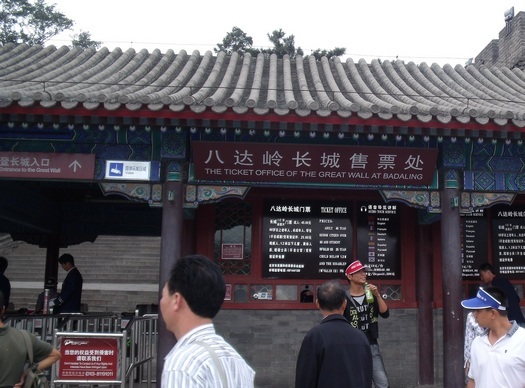 Great Wall Tickets with Photos and Comments: Below we continue our trip to the Great Wall of China at Badaling. The previous two photosets showed a train ride from Beijing to the Great Wall location, then the area outside the Badaling Great Wall gate. 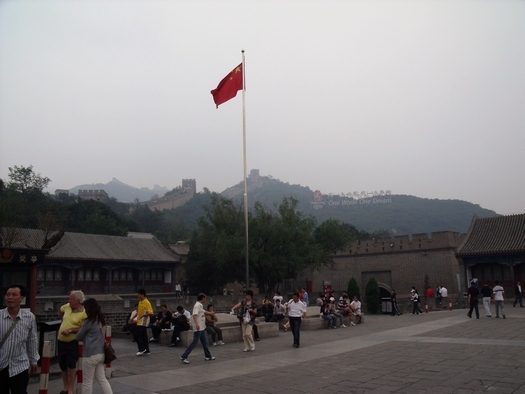 Now we continue the trip with more information and free pictures showing how to buy Great Wall tickets and start climbing. After passing through this gate, look to the right and you see the ticket-buying area and the entrance to the wall. The square is quite large and many people seem to hang around here. It's actually quite a nice place to view the wall from a distance. 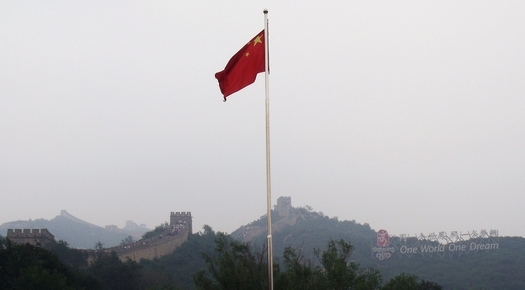 Here you see three symbols of China: the Great Wall of China, the Chinese national flag, and the "One World, One Dream" theme of the 2008 Beijing Olympics. China's connection to the Olympic dream is now part of the Great Wall experience, displayed for all to see. It is not surprising that the Olympic sign has stayed up more than a year after the event ended. My Chinese friends all view the Beijing Olympics as a great success that opened many international eyes about modern China. It was also a great expense and effort for the Chinese people but I have not talked to one Chinese person who says it was not worth it. I personally think China did a fantastic job on the Olympics. Any following Olympics will have to work very hard (and expensively) to match China's efforts. Who can compete with 1.3 billion people working together to proudly show off their progress and expertise? Across from the flagpole is the ticket booth. One of the interesting things you can see in this picture: the cost of Great Wall tickets is the same for Chinese citizens and foreigners. In many Chinese tourist places 15 years ago, the foreign price was much higher - up to 10 times higher! I suppose it was set to be sure that Chinese with lower incomes could afford it, but to us it seemed designed to soak the foreigner. Now, with the increasing affluence of the typical Chinese tourist, the differential pricing has pretty much disappeared but don't be surprised if you still see it in places off the beaten track. 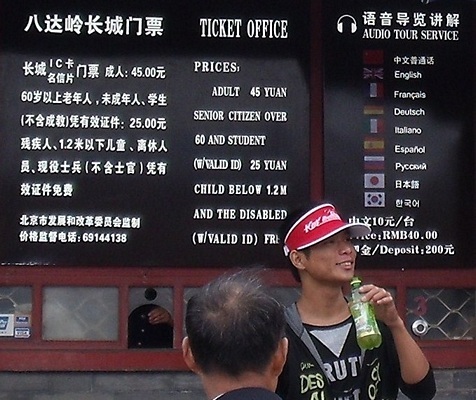 Another interesting part of that ticket booth photograph is not really anything about Great Wall tickets -- it's the young man. I can't guarantee that he's from mainland China (as opposed to a foreign tourist) but he probably is. He has what I think of as the young China "look": brash, trendy, confident, and probably a bit arrogant. I'm seeing that look more and more in China's youth. Here's the ticket you get (plus a hole punched when you go through the turnstiles at the entrance). As you can see, it makes a decent souvenir. As Great Wall of China photos go, this is a nice one from a clear day. The day I went was a bit overcast as you see from my photos. Here's the back of the ticket. 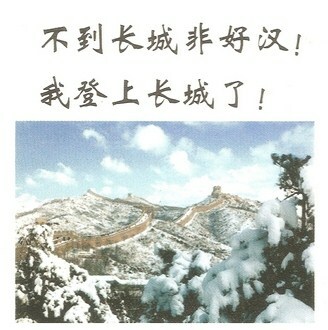 Note that Great Wall tickets are also postcards! The six boxes at the upper left are for the six-digit Chinese postal code. The part you see here shows an interesting photograph of the Great Wall of China in winter snow. The lower of the two lines above translates as "I ascended the Great Wall!" In wintertime, that would be a particularly noteworthy achievement - the stone steps would be very slippery! No comments about the Great Wall of China would be complete without a discussion of what you see on the upper line here. "Bu dao Changcheng, fei hao han" is a famous saying derived from a Chairman Mao poem during the Long March in 1935. Mao was apparently talking about his soldiers completing the march but the direct translation is now applied to all: "Never arrive [at the] Great Wall [literally "Long Wall"], not [be] good Chinese!" 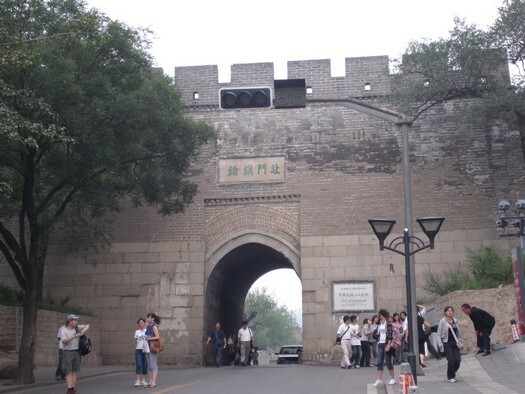 It is taken to mean "If you've never been to the Great Wall, you're not a true Chinese." The postcard includes a stamp for Chinese domestic postcard postage, which is 80 fen (about 12 cents U.S.). Go through the turnstiles and up a short flight of stairs, and you'll get to the first platform. 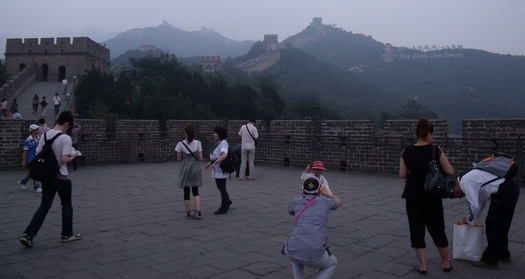 This is another favourite spot for photos even though it is so close to where you buy the Great Wall tickets. Most people go in the direction you see here, toward the "One World, One Dream" sign. You can go the other direction from this platform, but I didn't and I'm not sure how far that branch goes. I saw only a few people on that part of the wall this day. Here's a closer shot of the Olympic motto sign. As I mentioned above, Chinese people are very proud of the way the Beijing Olympics turned out. Many take pictures with this sign in the background, and further on I saw many leaving the wall to go to the foot of the sign for another photo op. Heading up with the majority of the people, it looks like you just have to climb to that third tower you see. Well, if you think that (like I did) then think again. 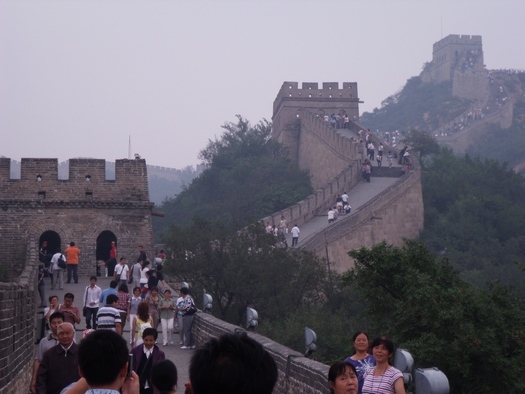 Going from where you buy Great Wall tickets to that tower is actually barely starting your hike. Click here to continue this climb up the Great Wall.